Download "Making Foreign Languages compulsory at Key Stage 2 Consultation Report: Overview"
1 Making Foreign Languages compulsory at Key Stage 2 Consultation Report: Overview Introduction This report summarises the responses to the consultation on the Government s proposal to introduce foreign languages as a compulsory subject at Key Stage 2. The consultation was open from 6 July to 28 September 2012 and this report is based on the 318 responses received. Background Modern Foreign Languages is currently a compulsory National Curriculum subject in maintained schools in England at Key Stage 3 only. In January 2011 the Government launched a review of the National Curriculum. After consideration of evidence from other countries, advice from key stakeholders and responses to the review s Call for Evidence, the Government s Expert Panel for the review recommended that the teaching of languages should be introduced earlier in the National Curriculum. Following this, on 11 June 2012, the Rt. Hon. Michael Gove MP, Secretary of State for Education, announced the Government s intention to add breadth to the primary curriculum by requiring all maintained schools in England to teach a foreign language at Key Stage 2, from Year 3 to Year 6. Headline findings The vast majority of respondents (91%) agreed with the Government s intention to introduce foreign languages at Key Stage 2. Respondents reasons included the view that young children have a natural disposition for learning languages; that making the subject compulsory was important to ensure its place in schools curriculum; that it would lead to better attainment at Key Stage 3, and greater take-up at Key Stage 4; and that pupils would benefit from a more global outlook and enhanced career prospects. A very small proportion of respondents (3%) were opposed to the proposal or unsure (6%), and many of these suggested that languages should not be a priority for this age group compared with other subjects such as literacy, numeracy and science. The responses showed that French, Spanish and German would be the most popular choices for primary schools, followed by a smaller proportion for Italian and Mandarin. A small number of schools suggested that they might teach other languages, although this was often as an additional language offer. Some respondents suggested that there should be a multi-language model so that children learn generic language learning skills, which are transferrable at secondary level. The majority of respondents were of the opinion that all children benefited from learning a foreign language, including those whose first language is not English, those with special needs and higher attaining pupils. Respondents also highlighted a number of points that would need further consideration to achieve the desired outcomes. They noted that few primary school teachers were qualified linguists and felt that it may be difficult for Key Stage 2 teachers to deliver teaching of a suitable standard in this specialised area. Many commented on the need for funding to provide training and resources to deliver the curriculum effectively. They also stressed the need for close liaison between primary and secondary schools. This would provide support in delivering the proposed curriculum and would ensure successful transition, into and progression at, Key Stage 3. 2 Next steps Having carefully considered the responses to this consultation, and the strong support for the proposal, the Government has decided to proceed with making languages a statutory subject at Key Stage 2 from September Having carefully considered the responses to the consultation, as well as a range of relevant factors, the Government wishes to seek views on a new proposal to require primary schools to teach one or more of the following languages at Key Stage 2: French, German, Italian, Mandarin, Spanish or a classical language (Latin or ancient Greek). Schools would, of course, be free to teach other languages in addition to one of these. We intend to consult on both of these aspects and have published a further consultation document to that effect in parallel to this report. Making languages a statutory subject at Key Stage 2 would be achieved by Order, the draft of which is published as part of that consultation. The proposal to require primary schools to teach one or more of these seven languages would be achieved by drafting an order under section 84(4), which will set out the meaning of a foreign language for this purpose. We will also consider the points made about workforce training and support, as part of our planning for the implementation of the new National Curriculum. A further statutory consultation on the proposed content for the Programmes of Study will take place in the New Year. Overview of responses The organisational breakdown of respondents was as follows: Higher Education* 144 Primary School 79 Secondary School 28 Local Authority 12 Organisations representing school teachers 12 Other 1 10 Subject Association 9 Parent 8 Academy/Free School 7 Employer/Business Sector 7 Special School 1 Young Person 1 Total: 318 * There was a mini campaign from Warwick University students (123 responses) which resulted in the high number of higher education responses. They answered Q1a and b only and were very supportive of the proposal. Throughout the report, percentages are expressed as a measure of those answering each question, not as a measure of all respondents. 1 Those that fell under the other category include educational consultants, a private tutor, former educational professionals and teachers and two representative bodies. 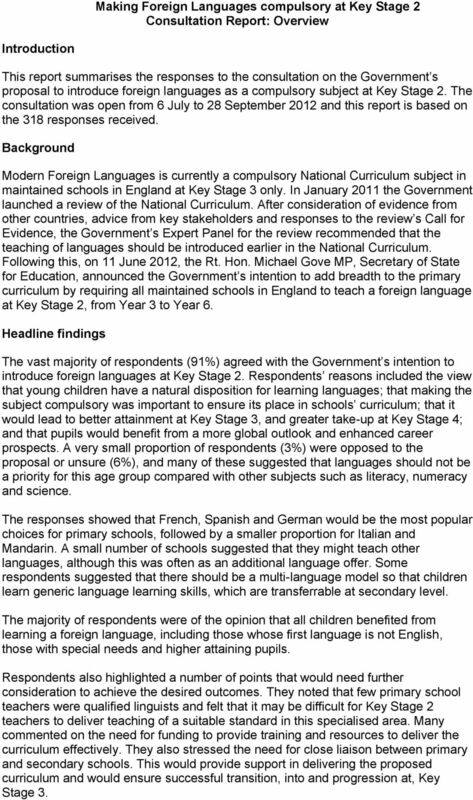 3 Summary of responses 1a) Do you agree with the Government's proposal that foreign languages should become compulsory at Key Stage 2 in maintained schools in England from September 2014? There were 318 responses to this question. 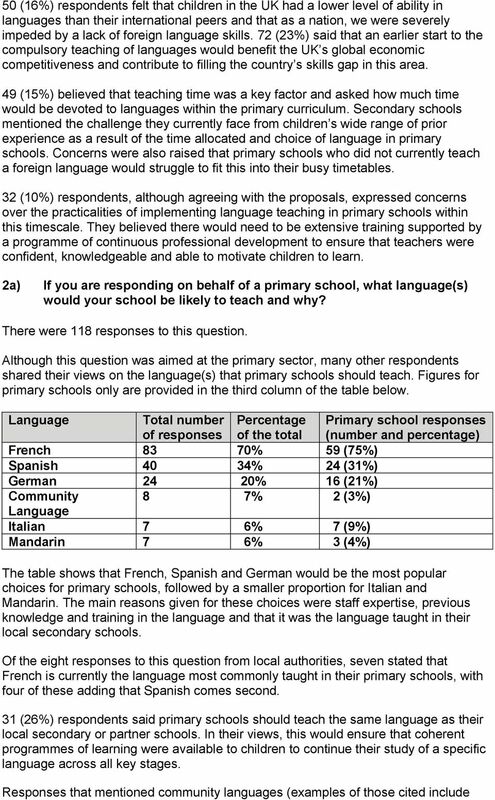 Yes 289 (91%) No 11 (3%) Not Sure 18 (6%) The vast majority of respondents agreed with the Government s proposal that foreign languages should be made compulsory at Key Stage 2 in maintained schools in England from September Their reasons are explained in more detail in question 1b) below. Overall, respondents agreed with the reasons put forward in the consultation document and thought that young children had a natural disposition for learning languages. They felt that progressive and engaging language lessons were much more likely to be timetabled, taught and embedded into the wider curriculum if they were made compulsory at Key Stage 2; and that this would lead to better attainment at Key Stage 3, greater take up of languages at Key Stage 4 and provide children with a more global outlook and enhanced career prospects. The minority who disagreed or were unsure felt that many children were still struggling to master basic knowledge in the core curriculum and that literacy, numeracy and science skills must meet required standards before children were expected to embark on learning a new language. It was also mentioned that the current curriculum was already overcrowded. Respondents, whether agreeing or disagreeing, expressed concern about the lack of access to high quality initial teacher training and continued professional development, and about the quality of language teaching in primary schools. These issues are covered more fully towards the end of the report (principally in question 5a). 1b) Please explain the reasons for your answer. 169 (53%) respondents suggested that children learnt new languages more easily if they did so at a younger age. They believed that young children assimilate languages more quickly and easily as they are more receptive to learning new sounds and pronunciation. It was mentioned that young children were less anxious, selfconscious and inhibited than older children and tended to be less embarrassed about speaking; they were also comfortable with switching between English and another language. They believed that having an interesting, fun and quality language curriculum would support languages teaching in secondary schools and increase the take-up of languages in later school life. 158 (50%) respondents said that improving language capabilities would offer a valuable educational, social and cultural experience, providing greater understanding and tolerance of other people, cultures and societies and broadening their minds to an increasingly international environment. 107 (34%) felt that learning a language supported the development of literacy skills in English and that it enhanced problem solving skills demanded by other areas of the curriculum. 5 Polish, Urdu, Bengali and Hebrew) suggested that these languages should be encouraged or celebrated, although none of the responses from primary schools specifically stated that they would intend to teach a community language only. 22 (19%) respondents believed that a multi-language model, which gave pupils a love and understanding of languages more generally, would be a better start for young children. This model could widen their outlook and avoid the potential issue of teachers lack of subject knowledge and confidence that could arise from focusing on a single language throughout Key Stage 2. Although respondents recognised secondary schools desire for consistency in language learning, they were of the opinion that being taught generic language learning skills, which are transferrable to language learning at secondary school, was more important. 2b) If you replied to the question above, would the language(s) your school teaches be likely to change over time and if so, why? There were a total of 101 responses to this question. As above, not all of these were from primary schools, from which there were 63 responses (detailed below). All: Yes 17 (16%) No 38 (38%) Not Sure 46 (46%) Primary schools: Yes 7 (11%) No 23 (36%) Not Sure 34 (53%) 38% of the total number of respondents felt that they would continue teaching the current language of their choice, and would only change this as a result of changes in staffing or in the teaching offer at secondary schools. A quarter of respondents were unlikely to change their current model because it was embedded and because a great deal of work had already been done to develop the skills of the teachers and build the resources available to deliver their preferred language. 16% of the total number of respondents believed that what is needed is a flexible approach to language choice rather than a narrowly prescriptive one focussing on learning one language. 3) How might the proposals affect different groups of pupils? There were 155 responses to this question. The majority of respondents were of the opinion that all children benefited from learning a foreign language and that it offered them huge opportunities. They suggested that children would all start at the same level and that language learning would build confidence. They also suggested that children enjoyed learning about different cultures and countries, and that this in turn could promote community cohesion and cultural awareness. Children with English as an Additional Language (EAL) 98 (63%) were of the opinion that children with EAL were experienced language learners and therefore better equipped to learn other languages. Most felt that these children would excel in this area as they are able to build on concepts of language learning that they have already acquired. 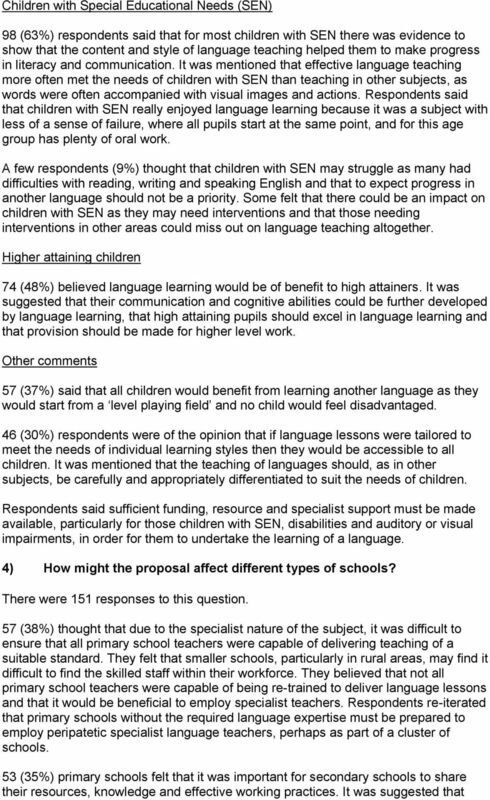 A small minority (8%) expressed concerns about teaching a further language for EAL children and said they would be confused, especially if they were struggling to pick up English. 7 Key Stage 3 teachers and foreign language assistants should work more closely with primary schools to support primary language delivery, through regular meetings or secondments. It was also suggested that a coordinator could be appointed locally, to provide support and consistency. Primary schools that had already begun to teach languages at Key Stage 2 could share good practice with other local primary schools that were not currently teaching foreign languages. 51 (34%) respondents felt that training was important and were concerned about the resource and professional development implications for different schools. 40 (26%) also raised issues related to funding. 29 (19%) said the proposals clearly had the biggest impact on schools that had opted not to deliver foreign languages so far, as there were huge implications in terms of staff knowledge, training, subject specialism, confidence and resources. 5a) If the proposals go ahead, what do you think the priorities will be for training and professional development of teachers? There were 174 responses to this question. 94 (54%) respondents felt that it was critical to ensure that teachers in the primary sector were trained to a high standard. They said teaching a foreign language required a high level of linguistic competence and that teachers must feel sufficiently confident and competent to deliver the curriculum at this level. It was felt that refresher training should be offered as appropriate, and that secondary foreign language teacher training could include supporting delivery in primary schools. 54 (31%) said that close liaison between Key Stage 2 and Key Stage 3 teachers is vital to share good practice and ease transition. Respondents also suggested that primary school teachers would benefit from observing specialist secondary school teachers. 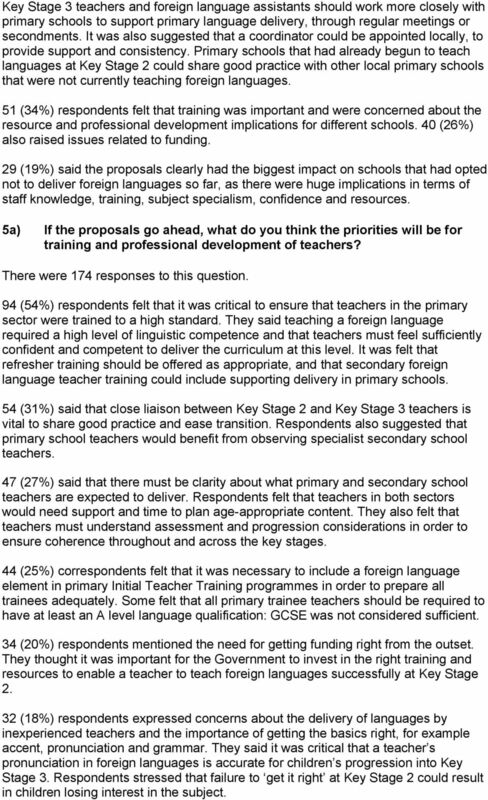 47 (27%) said that there must be clarity about what primary and secondary school teachers are expected to deliver. Respondents felt that teachers in both sectors would need support and time to plan age-appropriate content. They also felt that teachers must understand assessment and progression considerations in order to ensure coherence throughout and across the key stages. 44 (25%) correspondents felt that it was necessary to include a foreign language element in primary Initial Teacher Training programmes in order to prepare all trainees adequately. Some felt that all primary trainee teachers should be required to have at least an A level language qualification: GCSE was not considered sufficient. 34 (20%) respondents mentioned the need for getting funding right from the outset. 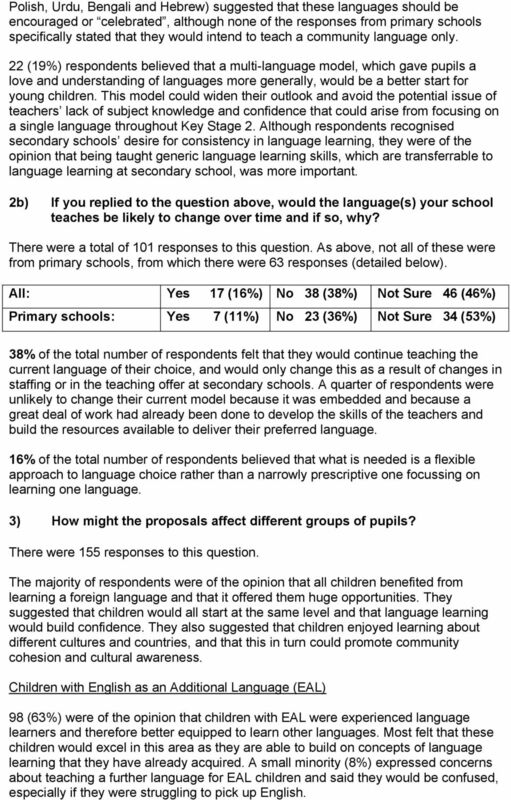 They thought it was important for the Government to invest in the right training and resources to enable a teacher to teach foreign languages successfully at Key Stage (18%) respondents expressed concerns about the delivery of languages by inexperienced teachers and the importance of getting the basics right, for example accent, pronunciation and grammar. They said it was critical that a teacher s pronunciation in foreign languages is accurate for children s progression into Key Stage 3. Respondents stressed that failure to get it right at Key Stage 2 could result in children losing interest in the subject. 8 5b) Do you have any suggestions for how schools and other stakeholders could work together to meet these needs? There were 152 responses to this question. 105 (69%) said that networks of schools for all stakeholders to work together was vital for dissemination of good practice. It was suggested that local focus groups and networks should be developed to work on curriculum and lesson planning, raise awareness of new policies and methods, share and develop resources, and discuss professional issues. Respondents felt there should be greater local coordination over the choice of languages between primary and secondary schools. 61 (40%) doubted that many schools currently had people with sufficient expertise to lead training and believed that language specialists and consultants must be employed to train teachers. 40 (26%) were of the opinion that local authorities must be involved in promoting and developing foreign language teaching in schools and in fostering good relationships between primary and secondary schools. Respondents noted that good progress had been made in the delivery of foreign languages by primary language teams and consultants employed by local authorities up until (25%) said that the most critical elements to the success of primary languages was the allocation of sufficient time, training and financial resources to schools and that the Government must invest in language teaching. Respondents said that many primary school teachers lacked confidence, experience and skills for teaching languages, and that this could be alleviated by primary language consultants or advisory teachers being funded to coordinate their support. 6) Please let us know if you have any further comments you would like to make about the proposals in this consultation document. There were 153 responses to this question. 116 (76%) welcomed the proposal of making foreign languages compulsory in Key Stage 2. Respondents believed, in conjunction with all the other positive points raised in this report, that language learning was an important part of a broad and balanced primary curriculum. 68 (44%) respondents thought that if compulsory teaching of languages was introduced then the quality of teaching in primary schools was vital to its success. 31 (20%) respondents mentioned issues around assessment and grading. 20 (13%) were of the opinion that the Key Stage 2 Framework for Languages was an excellent starting point for practitioners and that this should be re-instated. They believed that teachers had been using the Framework to good effect; and the language learning strategies and knowledge about languages elements in this must not be forgotten.